To create “PEL’s BINK! Mixtape”, BINK! selected key songs from his massive discography that includes hits with Jay Z, Kanye West, Drake, Dr. Dre, Faith Evans, Mary J. Blige, Mobb-Deep and more. 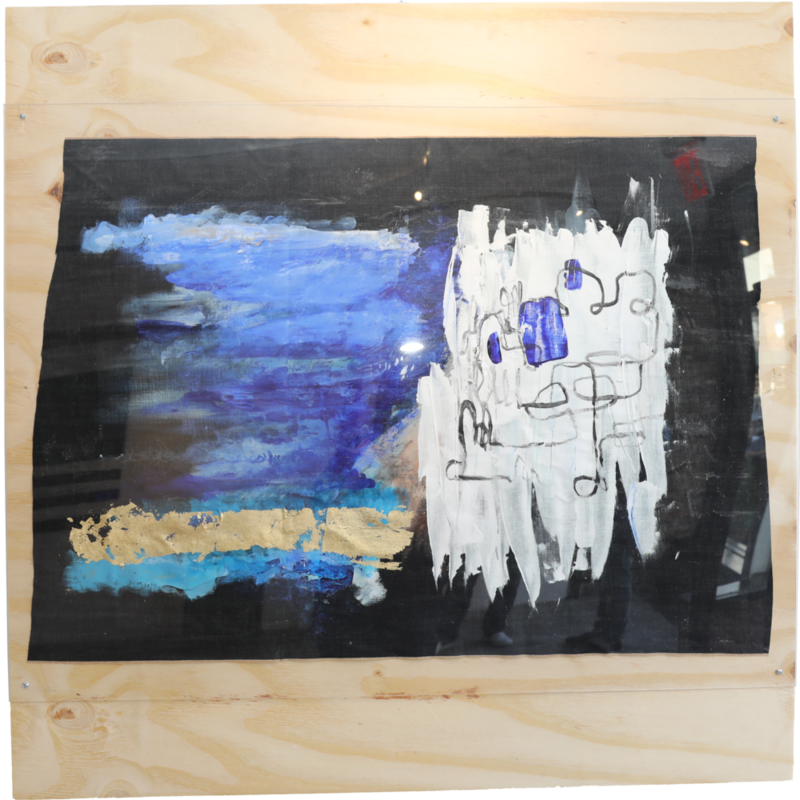 Pel deconstructed the lyrics including the samples, and using a variety of mediums from wood, acrylics and paint to gold leafing, brings the songs to life. Additionally, the visuals incorporate social, cultural and political themes while unveiling Bink’s personal inspirations and often life-challenging experiences while making these songs. This is a deconstruction of being a product of Reaganomics. The real hustlers are the ones with ultimate power. The matte and shiny giclee hand cut stickers are all placed in chronological order from Nixon all the way up to Trump. There are also various bank and defunct company logos seasoned in there. I also wanted to give a nod to infamous fictions drug dealers such as Tony Montana and Mr. White. 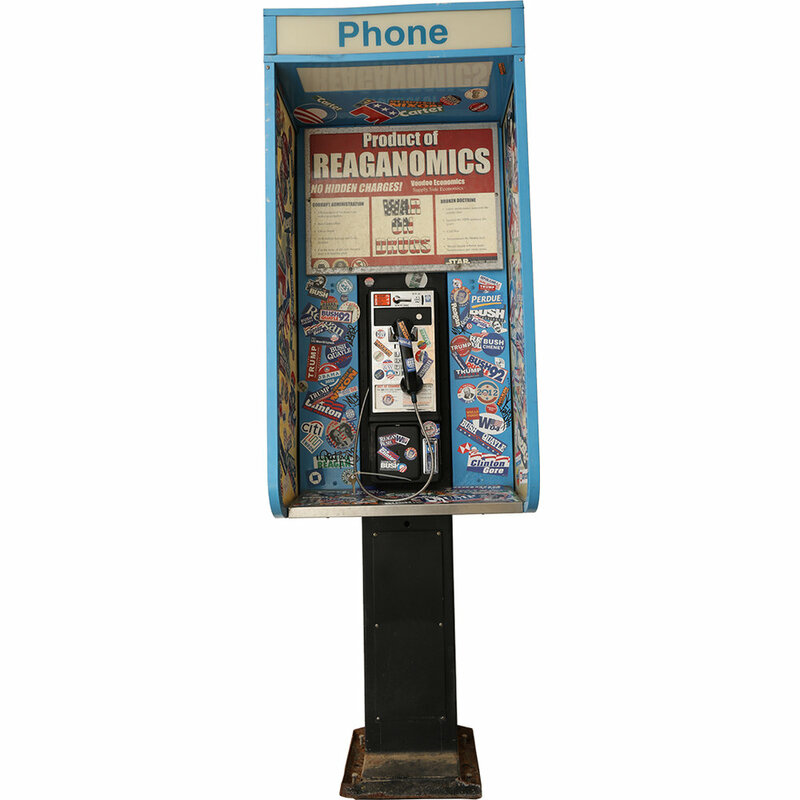 The Product of Reaganomics advertisement was fashioned after the original ad that came with the phone. The word MDK is tagged on the side of the pay phone because that was actually Bink’s voice that was calling in on the record. All the stickers and work is in the inside of the phone to show that all the underhanded actions happen on the inside. I also started with Nixon as president because Jay Z was born in the Nixon era. The smoking cherub is a reminder that none of us are free from temptation. 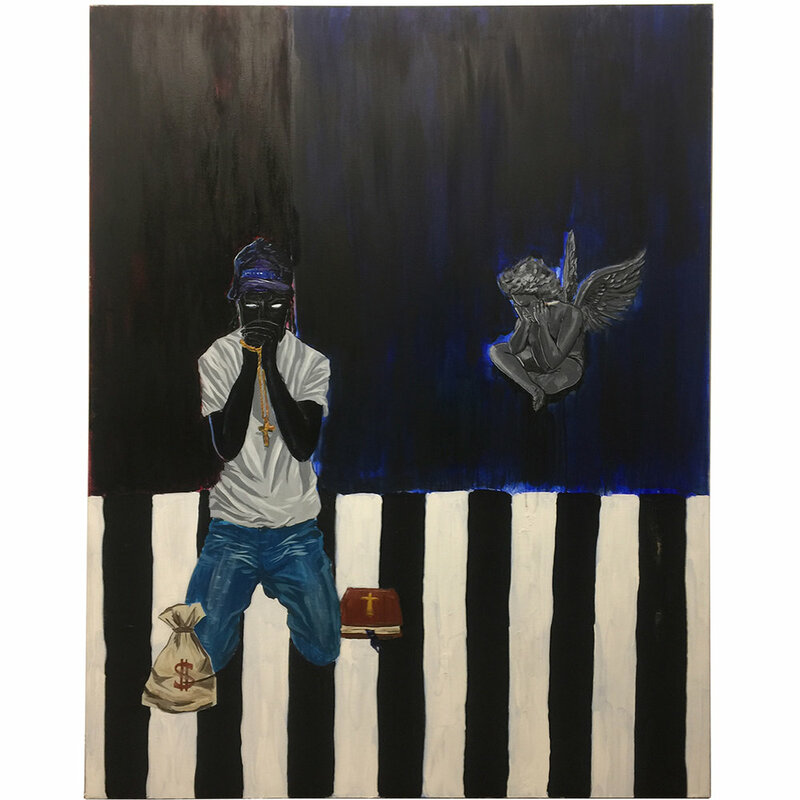 The boy painted in all black, with blue hues represent, “black and blue” marks or bruising that you may see after a physical altercation. I was inspired by Kerry James Marshall, and authors Ralph Ellison (Invisible Man) and Ta-Nehisi Coates (Between The World and Me) and their literal interpretations of societies acceptance around the unlawful physical abuse regularly bestowed on the bodies of Black men. The box is hand wood burned with various words from the song giving a tattoo effect similar to that on the skin of Rick Ross. Vintage cigar labels are used and embellished with motifs of Florida where Rick Ross hails from. 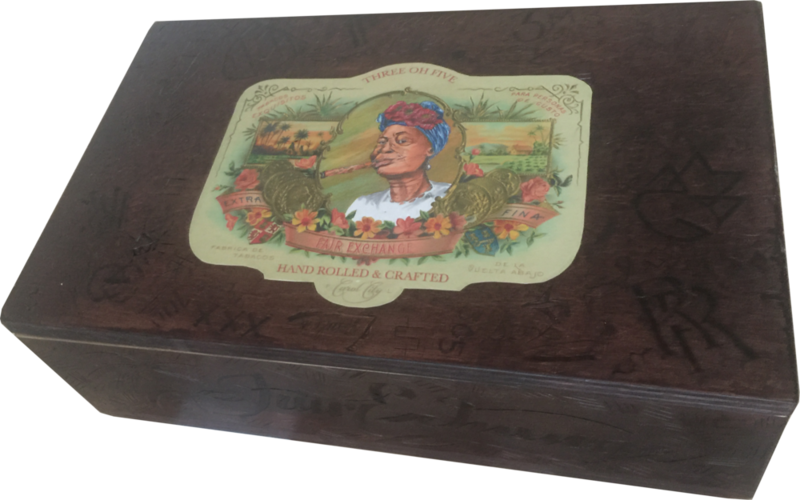 The Copic marker hand drawn woman gives a nod to Cuban cigar culture but also while the poppies remind us of the colorful allegories rapped about via the drug trade. toThe caliber of the shells are .45, 5.56, and .308 with the words give the break down that bad intentions come from a good place. Sometimes love hurts. A young man shooting a rock on his sling shot that turns into a diamond (that is the shape of the diamond that Jay Z would throw up in the air). The diamond is made of mirror to remind us that we are all reflections of our former selves. The grip tape on the board is the logo of the American punk rock band the ‘Misfits’. I did this to remind us that we all tend to be “misfits” at different times throughout our adolecent years. Under the skate board the colors flow from black to gold, from darkness to wealth, from nothing to something (or so it seams) with the calligraphic inscription “the future is now”. The woman on the bottle is representative of the woman that will not die blue in the Marvin Gaye sample ‘If I die tonight’. The bottle used to represent the champagne is pouring out from the man trying to court her. The man happens to be ‘Mr. BigStuff’ a reference used in another sample used in the song. The chair hangs from the ceiling to depict the descent of “Hova” or Jay Z from “heaven”. The literal interpretation heavily focuses on Jay Z being on a hip hop pedestal, and the carvings on the chair represent all of the things Jay Z built during his rise to hip hop immortalization. The American flag represents his Roc Nation affiliation as well as the sociopolitical climate, heavily influenced by race relations in the United States. Dre’s most personal song on the ‘Compton’ soundtrack. 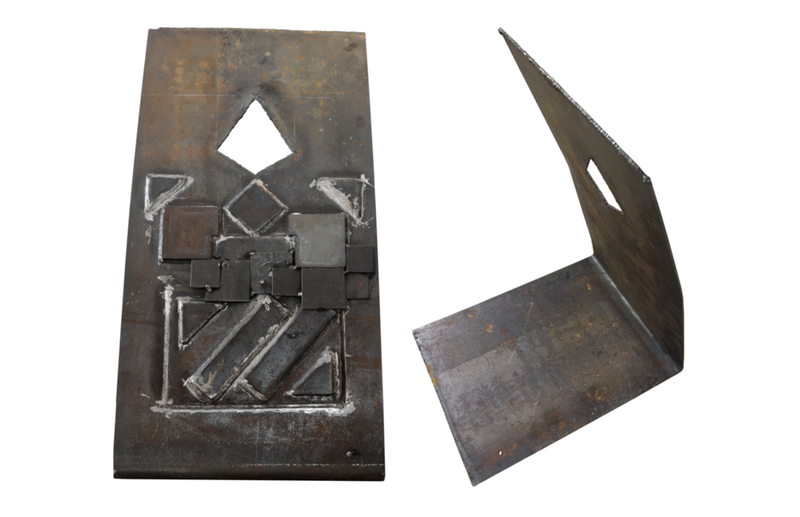 The wood shims represent the unseen foundation as they are usually covered up by flooring and the walls but play an integral part in leveling the respective objects they sit behind. The words that are etched and painted in the wood hail back to the mantra Dr. Dre continued to repeat throughout the song, to advise the listener that even though he was seen to be successful he still had a long way to go. The money is placed wearing over their respective shims to let you know as much as we are looking for the money that the money is also looking at us to see what we are going to do with it. The money represents 2015 with a $20 bill and 15 $1 bills. The wax represents popular figurative language “burning the candle at both ends” meaning, exhausting one’s self to completion. 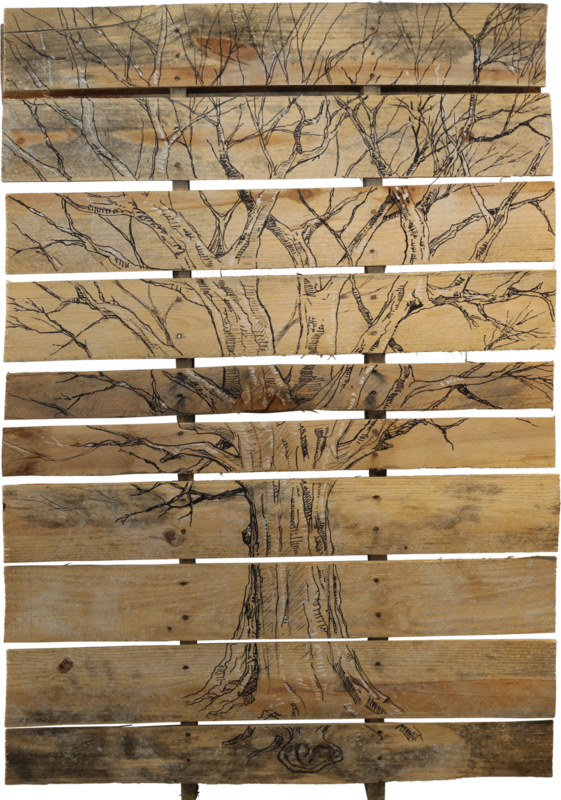 This piece shows what happened after Drake’s line “I’m in your girl’s ear planting seeds…” The wooden pallet was used because they are used to carry weight just like Drake’s words in a woman’s ear. I wanted to keep the style very loose as an ode to my sketch style when jotting out rough ideas. The devil is torn. He was once the right hand of God and now the epitome of evil. The idea of the devil once being an angle is shown by the hints of blue and white that peak through the harsh red and black tones. The new dress is represented by the tattered gold leaf. The raw piece of selvage denim represents a divergence from ones righteous path. The skull used is the same model as Warhol’s “Skull”. The idea of life coming to a closure through the candle being out and the idea of life in its background being depicted by the grapes. Even though the grapes are alive and celebrate life and good tidings through wine but they are still lying because they have been picked. The red toned canvas is a nod to Redman whilst the tally are representative of the art work on Beanie Sigel’s ‘The B. Coming’ album that the song is on. This is a deconstructed look at Santorini Greece. The gold leaf represent the sunlight reflecting on the water separating the heavens and the water. Selvage Italian denim was used as the canvas to reflect the raw depiction of cultural growth. The loose deconstruction of the infamous pictures taken of Santorini reminded me of the conversation that even if it is seen it is still out of reach as Rick Ross notes in his song. This piece depicts the parallel of the old to the new through the comparison of Rick Ross and Biggie Smalls (sampled used in the song). I further made the comparison of old to new by referencing a picture of Biggie in a Coogie sweater with a rubber band around his hand as he was counting money. The new component in that conversation are the Christian Louboutin sneakers that the subject is wearing that are referenced in the song. The hands on the Vacheron watch that is on the wrist of the subject point to Biggies Death 3/9. Rick Ross’s line “Never lay my Jesus piece face down” represents the gratitude expressed before starting the day.